From now on when I write anything about POTUS Trump, I'm going to choose a happy image to go alongside the post instead of his awful scowling orange face and ridiculous fake hair. For example - look at this adorable puppy! Don't you want to play fetch with this pup, give it dog treats to chew on, and scratch it behind the ears? I'm smiling now looking at it. 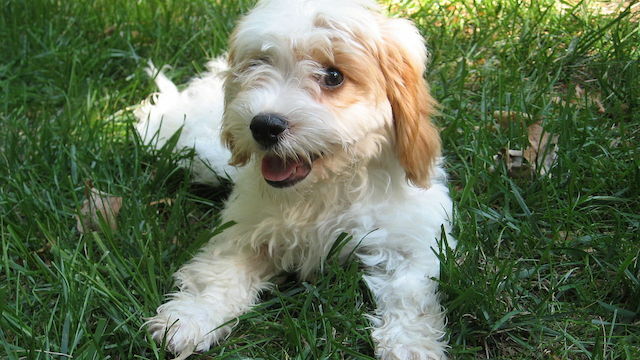 I learned today that this is a "Cavapoo," which is something I had never heard of before. For those like me who were uninformed that's a cross between a poodle and a Cavalier King Charles Spaniel. That is one adorable dog. All the treats puppy - you can have them all. I don't own a dog but I'd be happy to give one like that a home. Now that we've at least gotten off to a lovely start, let's let the reality of the awful new America we now live in sink in a little deeper. POTUS Trump has only been in office for four days and he's already had four egregious sins we can attribute to him and his administration. Not exactly what I'd call a stellar record. Here's what's happened so far. 1.) Trump is "hugely popular" at his inauguration. False. Press secretary Sean Spicer called a press conference to rip on the media even though a non-partisan camera from the top of the Washington Monument snapped both of the photos seen here. The Trump administration tried to claim he was "hugely popular" and had a "record turnout" for his inauguration, but when the media coverage highlighted these photos, Spicer went ballistic, and then took no questions from the media who tried to correct him. Trump went on to say that journalists are "the most dishonest human beings on Earth." Welcome to the new normal. 2.) The Trump administration embraces "alternative facts." Trump can lie all he wants, but the facts don't lie, so his spokeswoman and counselor Kellyanne Conway cited "alternative facts" instead. Thankfully Chuck Todd from Meet the Press called her on that BS given that "alternative facts" are nothing but LIES. Let's look at the cute puppy again for a moment. That's a good puppy. Aww. Now just remember that the leader of the free world is accusing journalists of being unethical, while simultaneously ordering everybody who works for him to lie on his behalf, and call it "alternative facts" to try and get away with it. What a load. 3.) Trump removes the U.S. from the Trans-Pacific Partnership. If it feels like everything POTUS Trump does is designed to flip a middle finger to President Obama, including his pledge to "repeal and replace" the Affordable Care Act (which he and other critics call "Obamacare), you'd be hard pressed to use Trump abandoning the Trans-Pacific Partnership as proof of the opposite. The deal was one of many chapters in President Obama's legacy that would have been good for America in the long term. Protectionism, tariffs, embargoes and hostility toward Asian countries are not. Trump calls it a "bad deal" without even knowing what a "good deal" is, which some might argue is the exact same way he ran his USFL franchise and the upstart football league itself into the ground. Why should a man who has gone bankrupt multiple times be trusted to call anything a "bad deal" simply on the basis of it happening on his predecessor's watch? 4.) Trump signed an unnecessary anti-abortion executive order. Even if you don't agree with abortion, the "Mexico City policy" or so called "global gag rule" is useless. It was first created by Ronald Reagan in 1984 was reinstated by Trump, and it bars the U.S. from donating to international nongovernmental organizations that offer or advise on a wide range of family planning and reproductive health options if they include abortion. The thing is that this has already been U.S. policy since 1973, but despite Trump telling Congress to stop wasting time, he just wasted our time with an executive order that serves no purpose except to put a global chill on women in poor countries who are already under-served and discriminated against when accessing health care. He did it to send a message, and considering he was surrounded by conservative white men when he signed it, I don't think anybody could have missed the intent of that message. Good puppy. Here's a treat. Bad POTUS. No treats for you.